If you and your partner have decided that it is time to take "the big step” and would like a far-from-conventional wedding, you could consider a Mayan wedding. Although this celebration is symbolic and has no legal value, it is sought not only to connect two souls but two people and nature. The ritual is conducted by a shaman in Mayan language. Before the bonding, it is tradition for the future spouses to immerse themselves in a temazcal, a steam bath with medicinal plants that purifies the body and spirit. On the day of the ceremony, both should dress in white, guests can wear light colors. The bride and groom stand inside a circle marked with sugar on the ground by the shaman, who has previously requested permission from the bacabes (Mayan gods) from each cardinal point (north, south, east and west). In the center, an altar is prepared with representative elements using white, black, blue, green, red and yellow, colors that symbolize the cycle of life. As in other religious ceremonies, badges of prosperity are given to the couple. In a Mayan wedding, prosperity is represented by cocoa. Corn is also given, so that they always have food on their table, and honey, so that the sweetness of love never goes away. The atmosphere is flooded with copal and cinnamon incense. Flowers and water are offered as symbols of the simplicity of life, seeds and balché, a Mayan drink made with tree bark fermented in water. During the ritual, traditional songs and music are played with drums, maracas and snail, which impregnate this special moment with mysticism, while the attendees surround the couple and accompany them until the end of the ceremony with candles, lighting their new path with good wishes. The banquet may consist of stuffed cheese, tamales, pickled turkey, chicken pibil, poc chuc and pozol, a local drink made with corn. Where can a Mayan wedding be held? Mayan weddings can be performed in blessed ancestral places, such as caverns, cenotes or spots surrounded by nature. Puerto Morelos is an idyllic place to carry out your Mayan ceremony since the waves at sea are low and there are many cenotes near this fishing town. In this video you can see what a Mayan wedding looks like. 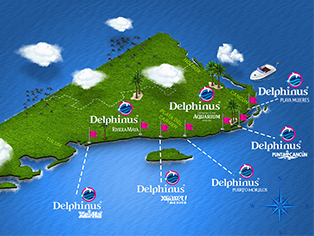 At Delphinus we want you to have a wedding that is out of this world. In addition to having the perfect stage and the perfect ring deliverers for marriage proposals, you can come with your new partner to swim with dolphins in the sea.